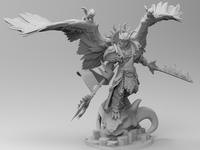 Dungeons & Dragons Miniatures by DannySanchez is licensed under the Creative Commons - Attribution license. 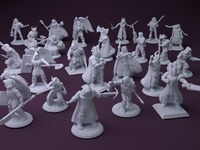 This is the complete set of figurines of the characters friends and I created for a party of Dungeons&Dragons. It includes two characters that are not available individually: Danario the Dragonborn and Waywalken the wolf. Feel free to modify to make your own and please share pictures if you do!